The National Association of Senior Move Managers® is proud to award the Senior Move Manager~Certified (SMM-C) credential to Amy Wright of reSettled Life, Union, Ky.
reSettled Life is a senior transition and auction company serving Northern Kentucky, Cincinnati and Southeast Indiana and is the only certified, full service senior move management company in the Northern Kentucky and Greater Cincinnati area. They help families move loved ones from their homes into smaller homes, senior-friendly communities, or nursing facilities. Services include organizing, packing, unpacking, resettling, and auctions. Learn more at www.resettledlife.com. Should You Talk to Your Parents About Downsizing Over the Holidays? Having the downsizing conversation is never easy for anyone involved. For both children and parents, it’s one more sign that the parents are aging, which is difficult to accept. One way to make it easier is to talk about it before the move becomes necessary. Ask your parents if they have thought about where they would go or what type of place they would like to live in next. Would it be a one-story condo near the water? Or a manageable apartment closer to you or one of your siblings? Laying this groundwork ahead of time gives everyone a chance to consider the options available before they have to become a reality. Another way to make the talk go better is to be prepared. If you have siblings, ask them if they think it’s time. If not, really listen to their reasoning and see whether it changes your mind or not. If all of you aren’t on the same page, it may be best to wait and approach the subject later. Having one or more family members not on board before you even talk to your parent is not a good start. Not only may you potentially be trying to convince your siblings and parents this is the right thing to do, you may be trying to convince yourself as well. People often feel guilty about bringing up the subject, even though they believe it will be better for their parents’ well-being. It also makes them face the fact that their parents are getting older and may soon be the ones needing help instead of the other way around. Take some time to deal with your own feelings so that you are ready to help your parent with theirs when you talk to them. While you shouldn’t try to decide exactly where your parent should live before talking to them, you should think about some of the options that make the most sense to you. Do some research on several possibilities and even visit them if possible to make sure you still think they would be a good fit. There are so many choices when it comes to senior living nowadays that you’ll want to know what’s available and what they have to offer. Once you have given your full attention to the conversation, listen carefully to their responses. Remember that you are still the child and they are the parent. Don’t tell them what you think they have to do, talk about the options you have researched and answer their questions as best as you can. Talk about the benefits of a new place – if it’s smaller it’ll be easier to clean and maintain; in a condo there are fewer utility bills to worry about paying; in a 55-and-older community everyone is around the same age, making socializing easier; they provide transportation to the grocery store, doctor, and other outings so driving isn’t an issue. Offer to go see a few different places together, but respect your parents’ wishes if they don’t want to yet. Being respectful of your parent’s feelings and offering to work together with them to find the right solution is a better approach than trying to take charge. Through open communication, you may both discover they’ve been wanting to move closer to you, or the upkeep of the current home is a burden, or staying in the place where a spouse or several neighbors no longer live is actually depressing. Then it’s time to take the next step. However, if that isn’t the case, don’t continue to push the subject until it becomes an argument. Allow some time for everyone to think it over and try again later to work together toward the right solution. In our line of work, we come across many personal collections. Items range from toys and coins to dolls and holiday decorations. Each of these collections has a story, both personal and historical. We would like to share some of those stories with you, starting with Depression glass. Up through the early 1900s, glass items were made by hand. Each piece was individually poured, cut and polished, making glass time-consuming – and costly – to make. To own a piece of glass was a sign of privilege. When the Depression hit in the 1920s, glassmakers were forced to either find another way to manufacture glass or risk going out of business. One such company was the Hocking Glass Company in Lancaster, Ohio. Named for its proximity to the Hocking River, the company was founded in 1905. According to the Anchor Hocking Glass Museum, the company could manufacture one piece of glass per minute when it started. Shortly before the Depression, they began using a machine that streamlined the process and allowed them to make up to 30 pieces per minute. The stock market crash forced them to create glass at an even cheaper rate, so they invented a machine that could make 90 pieces per minute. The glass made on this machine, and others like it in the area, came to be known as Depression glass. In an effort to encourage people to spend what money they had in their establishments, business owners started giving away depression glass with qualifying purchases. Filling up your tank at a gas station could earn you a dinner plate, a trip to the movies on “Dish Night” could net a coffee cup. Some pieces, particularly drinking glasses, were included in packages of Quaker Oats and boxes of laundry detergent, and families would collect a complete set, one glass at a time. For larger pieces, like a platter or punch bowl, frugal housewives would collect multiple coupons or proofs of sale to send in at the same time. Depression glass came in a variety of clear colors, including green, red, pink, amber, yellow and blue. Opaque glass was also available in white, jade green and black. The patterns printed in the glass often mimicked those used in the handmade glass only the truly wealthy could afford. For those with a little bit more cash, elegant glass was still machine-made, but had some finishing work done by hand after it was removed from the mold to smooth out edges or remove unsightly seams. The reasons people start collecting Depression glass are as numerous as the collectors themselves. Many older collectors remember using it as children, while others fell in love with it while visiting their grandparents’ homes. Some simply enjoy the hunt and finding a hidden treasure at a yard sale or consignment shop. The value of Depression glass varies widely, depending on your location and the rarity of the pieces. There are several things to look for when buying Depression glass to ensure you don’t buy a less valuable reproduction piece. True Depression glass is lighter and thinner than replicated glass and it often has small bubbles within the glass. Scratches on a piece often means it’s authentic because these pieces were used in everyday life, not just put on display. Seams on lids from molds and straw marks on the bottom of the glass where it would have been set to cool are also signs that the glass is truly from the Depression era. Whether you display it in a china cabinet or use it on a daily basis, Depression glass can bring a beautiful piece of history to your home. To better serve her senior transition clients, Amy Wright of reSettled Life in Union, Kentucky wanted to offer auctions as one of her services. To do so required her to be an apprentice auctioneer for one year, work 10 auctions, complete 80 hours of training, and pass the principal auctioneer’s examination. Having completed all four, she earned her principal auctioneer license from the Kentucky Board of Auctioneers on November 10, 2016. She now joins the 182 other women who make up a very small percentage of the 2000 auctioneers currently licensed in Kentucky. For the past year, Wright has been holding client auctions as an apprentice under a licensed auctioneer, but is happy to be able to do it on her own now. The majority of reSettled Life’s auctions are held online, although Wright is licensed to hold live auctions as well. Once the auction is complete, the company handles payment collection and distribution of sold items, giving clients more time to be with their families. 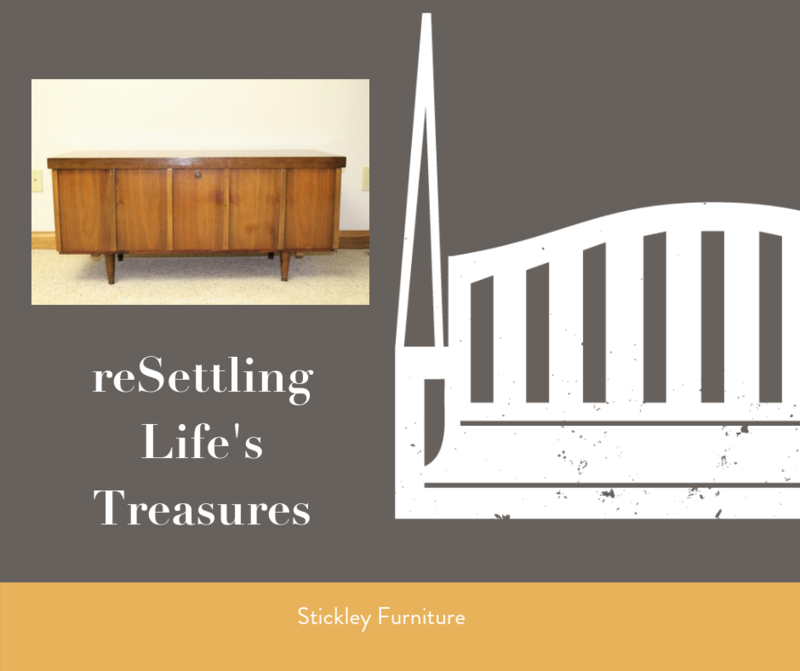 reSettled Life is a senior transition and auction company serving Northern Kentucky, Cincinnati and Southeast Indiana. They help families move loved ones from their homes into smaller homes, senior-friendly communities, or nursing facilities. Services include organizing, packing, unpacking, resettling, and auctions. Learn more at www.resettledlife.com. Your parents moved you when you were a kid. You moved into a dorm and various apartments during college. You moved when you graduated, when you got married, and when you took an out-of-town job transfer. Throughout the years, you have become a moving machine. Surely your next move – downsizing – will be the same as all the others. It may not be happening for a happy reason – In our business, the majority of people that we’re helping downsize are doing it because they need to. Maybe they’ve lost a spouse and can’t take care of the home by themselves, maybe they can no longer manage the stairs to the bedroom or bathroom, or maybe they’ve become unable to live alone. Whatever the reason, feeling like you’re moving because you have to not because you want to is very different and can be a very emotional experience. You can’t take everything – Oftentimes, you move from one size place to a similar sized or even larger one, so you can take everything with you. When you downsize, you move to a smaller space than you currently have, which means you will need to downsize your belongings as well. Parting with items that you have owned for decades or have sentimental value can be difficult. It’s hard to get rid of everything you aren’t taking – Rather than finding a new spot for everything in your new home, you’ll need to find places for those items you decided not to keep. Your family members may want some items, but don’t count on them to take everything. (see Making Your Memorabilia a Gift, Not a Burden blog ). Selling items through yard sales or online can be time-consuming and cause you to deal with strangers trying to talk you down on prices, which can be uncomfortable and less profitable. Donating is always a good way to rid yourself of unwanted items because they will be going to someone else who can use them, but some organizations won’t take certain things or will not come pick anything up. This downsize is permanent – You may have temporarily downsized before in your lifetime, either from your parents’ home to a dorm room, or maybe to live in a downtown apartment or overseas for a year. But your belongings were waiting for you when you returned. This type of downsize is normally permanent, so unless you have family members willing to house your overflow, whatever doesn’t fit in your smaller space will no longer be yours. Inventory and Sorting– Our team inventories and sorts homes to be downsized to help make the decision on what you want to take and what you don’t. Sometimes just having someone to help you figure out what you can live without and what you can’t will enable you to not feel so overwhelmed with the downsize and move. Floorplan Comparison – When we’re helping someone downsize, we use the floorplan of the new space to determine what can be kept and what won’t fit. We can show you different layouts that include certain things in one layout, and different things in another, allowing you to choose which will work best for you. Unwanted Items – After you have decided what you’re keeping and what your friends and family members want, we can take care of the rest. We hold online auctions for clients on a regular basis. We handle all aspects of the process from cataloging and photographing, taking care of payments, and handling the pick-ups. We’ll also arrange for items that aren’t sold to be donated or removed. Downsizing can be much more stressful than a regular move, but it doesn’t have to be. Let reSettled Life help you get from Point A to a smaller and more manageable Point B. Not all of our senior moves are for our senior residents, sometimes they also involve their favorite four-legged companions and those can come with some challenges of their own. We had the privilege of helping Ms. W make a transition from one independent senior community to another across town and needed to make sure we also included her two furry friends that would be making the move with her. Our team took a Friday afternoon to pack up Ms. W's belongings, leaving out items she would need over the weekend. We wanted to get as many of her personal items carefully packed to ensure that her new residence would feel like home right away. On Monday morning we arrived to meet the movers and oversee the move day. The decision was made that Ms. W's daughter would transport her beloved felines, following along with a reSettled Life policy, and we would make sure everything else was loaded on the moving truck and delivered to her new senior community. Although the cats ended up being a little more difficult to wrangle than we had originally thought, they were eventually secured and made their way to their new home ahead of Ms. W.
Our reSettling process was a smooth one, as we loaded Ms. W new home with all of her favorite things, making sure to place those items in the same location they were at her previous residence and hanging every family picture and heirloom that she had on her walls around her room. Her furry friends stayed put in the bathroom, to become more acclimated with their new surroundings, and were ready to roam freely by the time we had finished up. When we had every box unpacked and removed from the room, every picture hung and cabinet filled, we said our goodbyes. We left Ms. W with a huge smile on her face and a sense of relief that the overwhelming move was complete and had not been as stressful as she thought it would be. Knowing we had a happy senior client, already settled in her brand new home, gave us a sense of accomplishment and satisfaction, which meant we were able to leave with a smile!